This rechargeable light is both a torch and directional work light. Working in shaded or dark corners can make work more difficult, especially in the winter months when sunlight is seemingly to ten minutes either side of lunch. 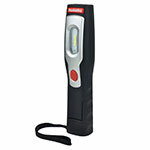 A good quality work light can banish the darkness and bathe your work area in luminosity, and the great thing about these ones is that they are rechargeable, eliminating the need to worry about replacement batteries. With two hanging hooks and the ability to bend through 180 degrees, there should be no dark work corners safe from the glare of this light.